A Russian S-400 air defense missile system drives during a rehearsal for the Victory Day military parade in Red Square on Thursday, May 3, 2018. India’s defense minister reiterated New Delhi’s determination to go ahead with procuring the Russian-made missile air defense system. The United States passed the Countering America’s Adversaries Through Sanctions Act (CAATSA) against Russia in August 2017 for reportedly influencing and manipulating the 2016 presidential election process. Core provisions of the CAATSA, including sanctions on Russian business entities and senior Russian political and business figures, came into effect in January 2018. The Indian defense minister is expected to raise the issue of sanctions under CAATSA, which could kick in on any Indo-Russian defense procurement deal above $15 million, at the upcoming 2+2 talks between the Indian and U.S. defense and foreign ministers scheduled for this month in Washington DC. The imposition of sanctions by the United States on India is seen as highly unlikely. Nonetheless, India’s decision to move ahead with the S-400 acquisition could impact future U.S.-India defense deals, including the possible procurement of armed U.S.-made Predator drones or the establishment of joint aircraft production facilities. India and Russia reportedly concluded price negotiations last month. The signing of the final contract is purportedly expected during a summit meeting between Indian Prime Minister Narendra Modi and Russian President Vladimir Putin scheduled for October 2018. 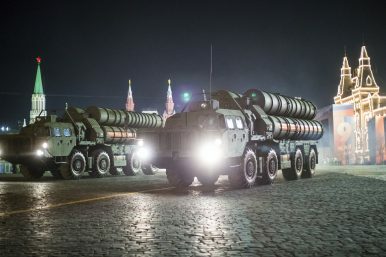 New Delhi and Moscow concluded an inter-governmental agreement for the purchase of the S-400s already in 2016 (See: “India and Russia Ink S-400 Missile Air Defense System Deal”). Neither Indian nor Russian officials have so far publicly commented on what type of surface-to-air missiles will be delivered to the Indian military under the deal.